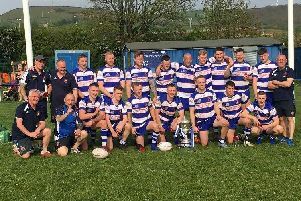 It was a slightly better showing after they had conceded a half-century of points against Hunslet Warriors at Greetland the previous Saturday. Their misfortune with injuries continued when Richard Crawshaw turned an ankle in an early tackle and had to be helped off the pitch. Then, from an attacking scrum on the five metre line, Myton worked an overlap to score a converted try. Elland had plenty of possession but were unable to complete their sets. Successive penalties moved the visitors from Hull up the pitch and poor tackling allowed off-loads, which resulted in a second converted try for 0-12. Elland hit back when Tom Hall set up Jorge Fairbank to burst through and reach his arm out to reach the try line. Phil Taylor converted. The home men again closed the gap, good passing down the line paving the way for winger Liam Manning to go over in the corner, Taylor converting. Elland attacked again but a loose pass was intercepted by the nimble fullback, who scored another six-pointer from long range. Myton made the game safe with another try three minutes later but Taylor had the last word when he regathered his chip kick and converted.